They have never met, but Alan Yoder and Ray Fite have something in common. They both lost much of their retirement savings to a shadowy entity known as Methwold International Finance Co.
Yoder, of Durango, invested $125,000 in a subdivision with local builder Cameron Winters. But Yoder said the money ended up in what turned out to be a Ponzi scheme. Whether he knew it was a Ponzi scheme or not, I dont know, Yoder said. Winters said he did not want to hash out a personal dispute with Yoder in the newspaper. But hes trying to put the Methwold episode behind him. I lost a lot of money, and it just about ruined me financially. Not just me, but a lot of other individuals, said Winters, who opened a zipline park in Durango. According to a list of investors obtained by The Durango Herald, neither Winters nor Yoder invested with Fred Baker, the former Durango man who is doing prison time for defrauding about 80 people in a related Ponzi scheme. But Baker knew Winters. Baker created a company for his scheme called Nth International and listed its address as 954 East Second Ave., Suite 102 in Durango  the same address and suite as Cameron Winters Construction, public records show. Fite, now living in Hawaii, invested with a Utah friend named Don Yarter, in what Fite was told was an international development project. Whether investors worked through Baker or Yarter or Winters, all their money disappeared into the same black hole  Methwold. Fite blames Methwolds foreign officers, not Yarter or anyone else in the Four Corners. These guys, it wasnt their first rodeo, and as far as I know, theyre still doing it, Fite said. 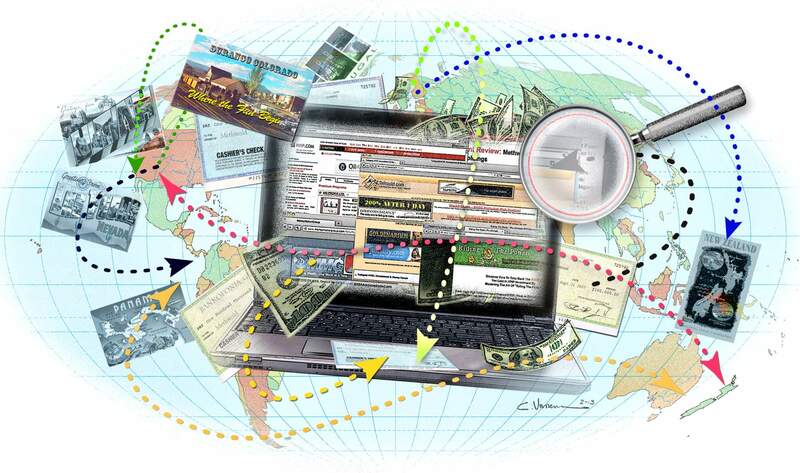 Internet searches for Methwold turn up mostly pages on Ponzi forums or consumer complaint websites where people say theyve been ripped off by the company or its officers  Rex Miller, Robin Marter and Jim Fergus. Its unclear whether Methwold was a Ponzi scheme itself or simply one of the many offshore, online companies that act as banks for other Ponzis. Methwold is registered in New Zealand, which is the easiest country in the world to start a company, according to the World Bank. The man who registered Methwold  Swedish citizen Carl Michael Magnusson  was arrested in Panama last May for money laundering. In 2009, Methwold filed a lawsuit in Las Vegas against people who said they lost money to the company. Its a little-known kind of case known as an interpleador suit, and its one of the only times in the legal system that its good to be the defendant, said Methwolds lawyer, Shane Clayton. The purpose is to let the judge determine which victims are owed money, and in return for joining the case, the victims give up their right to sue separately. Methwold wanted to deposit $1.3 million with the court, but to Claytons surprise, the judge said he didnt have jurisdiction. Some victims have reached private settlements with Methwold and got back some of their money, Clayton said. Others havent seen a dime. Methwold officers did not return a message left through Clayton. In any case, the numbers dont add up. Prosecutors in Colorado said Baker and his chief marketer, Mark Akins, were responsible for $1.7 million in fraudulent investments. Kevin Bryden, Bakers bookkeeper, kept a spreadsheet that the Herald obtained through a source. It showed Bakers investors were owed $1.4 million for his fictitious currency trades and another $1.2 million through private placement with Methwold. Apparently, all the money that Baker didnt spend on himself ended up with Methwold. But Bryden testified that he wasnt a trained accountant and might have made many errors on his books. And his spreadsheet does not cover dozens more people around the country and in Durango who lost money to Methwold but did not invest through Baker. Winters, for example, filed a response to the Las Vegas lawsuit that said he and his friends were owed $1.5 million. And other victims who werent related to either Baker or Winters claim more than half a million dollars in additional losses. Its unclear how Yarter, the Methwold frontman in Utah, fits in. Some investors call him a villain, and others say hes just another victim of Methwold. A Washington state victim, in a legal filing in the Las Vegas case, identified Baker and Yarter as the principals who directed the Durango scheme. But Fite, the victim from Hawaii, remains close friends with Yarter and said Yarter was duped out of hundreds of thousands of dollars. There are other Yarters and other Bakers, and many more victims, Fite said. Methwolds modus operandi, Fite said, is to choose local frontmen who can use their trust in the community to lure in victims. In New York, it was a psychic who recruited victims who shared an interest in New Age spirituality. In Utah, it was Yarter. Court documents and social media postings show many of the victims shared Yarters conservative politics. There were half a dozen other groups here in the states who had nothing to do with Yarter, nothing to do with Baker, and they still got screwed. So what does that tell you? Fite said. The Herald could not find contact information for Yarter, and messages left with his friends went unreturned. The U.S. Attorneys Office in Colorado knew that Baker had sent his victims money to Methwold, but prosecutors did not bring charges related to the company. The office did not answer questions about why only a portion of the case was charged. But during Bakers sentencing hearing in 2011, Assistant U.S. Attorney Bob Mydans offered a few clues. Mydans died of a heart attack while snowshoeing in Rocky Mountain National Park last February. No charges have been brought against Yarter. And the money has never been recovered, so someone is laughing all the way to the offshore bank. Wednesday: Old advice isnt working for new scams. Sunday: Fred Baker is serving time for his part in a Ponzi scheme, but he was just one player in a worldwide network of fraud. 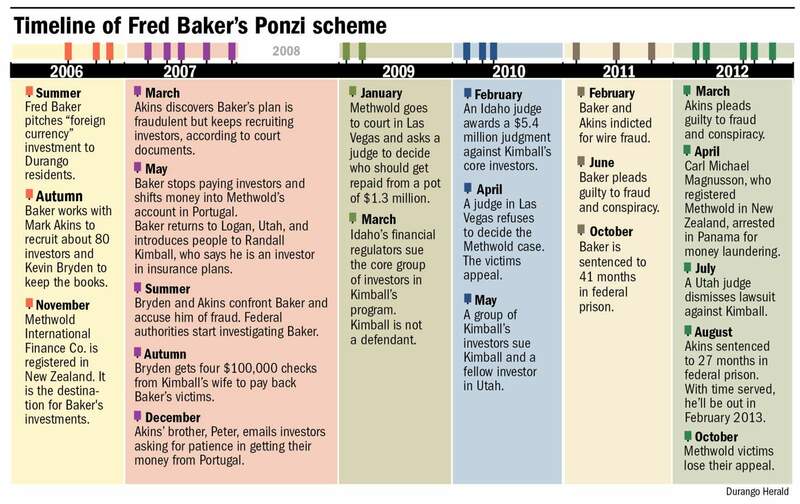 Monday: Four mysterious $100,000 checks to Bakers victims coincide with another fraud case in Utah. Today: The money trail from Bakers victims, and many others, leads to a company with ties to Panama, New Zealand and Europe. Wednesday: Victims often fail to heed advice for spotting financial fraud.